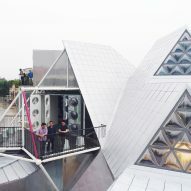 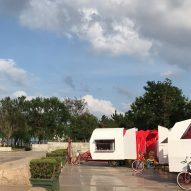 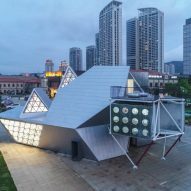 People's Architecture Office has completed a modular cultural centre in the Chinese city of Yantai, featuring a prefabricated metal structure and portable rooms that can be detached and cycled to other locations. 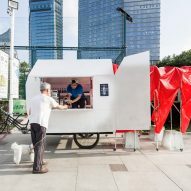 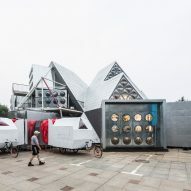 The Beijing-based studio designed The People's Station to demonstrate a range of concepts it has developed over the past seven years, including a prefabricated building system previously used to upgrade a small home in a Beijing hutong. 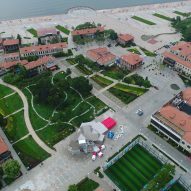 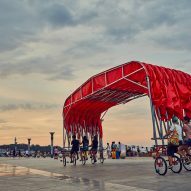 The People's Station is installed in Yantai's Kwan-Yen district, close to the central business district and a seafront promenade. 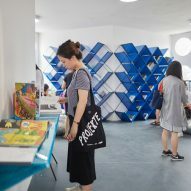 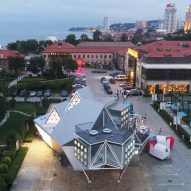 The building is positioned adjacent to a public park and is intended as a cultural hub containing an events space, lounge, bookstore and cinema that are accessible to passers by. 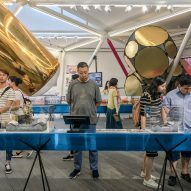 "The complex is designed to be a vibrant addition to the larger social fabric of the city of Yantai, actively engaging with its citizens," said the studio. 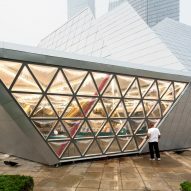 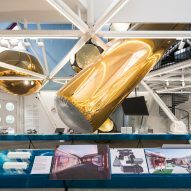 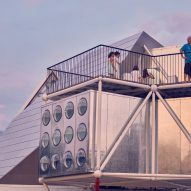 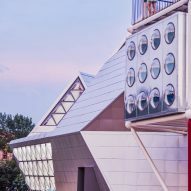 "With large open entryways, semi-outdoor areas and sections lifted above the ground, the building acts as a nexus that invites visitors to explore the historic core of the city," it added. 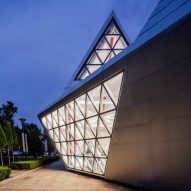 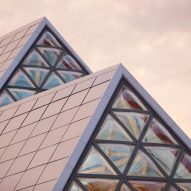 The building's main space is a large events hall that extends up towards a series of pyramidal roof forms. 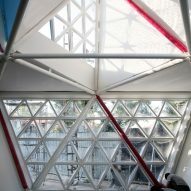 Sections of the roofs incorporate clerestory windows that flood the interior with natural light. 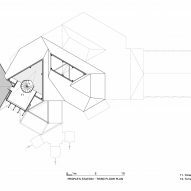 A spiral staircase ascends towards two further floors that are staggered so they both overlook the main hall. 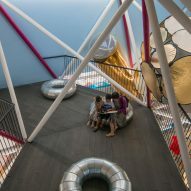 The first floor mezzanine provides space for a lounge, which is connected to a bookstore housed in modules incorporating bubble windows. 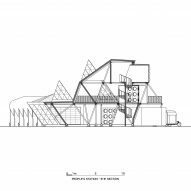 Appendages attached to the building on the ground floor can extend out like an accordion to increase the internal floor area. 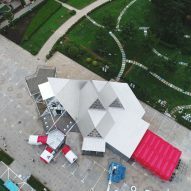 The smaller structures accommodate a bar, library and information point, with the larger canopy providing additional events space. 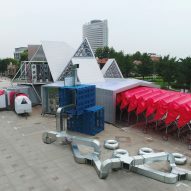 The mobile units can also collapse and detach from the main building. 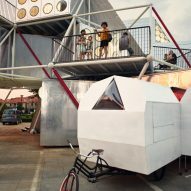 Three of them are mounted on tricycles and the other features multiple sets of bicycle wheels so they can all be easily relocated if required. 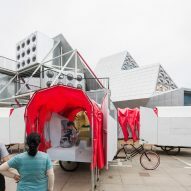 "These vehicles can be cycled to other locations as cultural satellites to host activities in hard-to-reach areas in larger Yantai," said the studio. 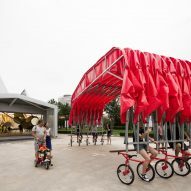 The portable and retractable People's Canopy was originally created in 2015 as part of an arts programme that saw it move around the English city of Preston. 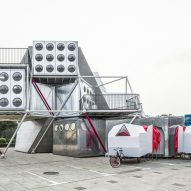 During Beijing Design Week 2015, the studio used metal ducting to create giant Chinese characters on the facade of a building, and at The People's Station similar components are used to form bench seating around the structure. 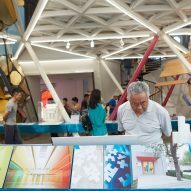 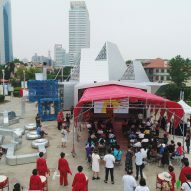 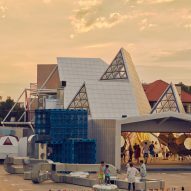 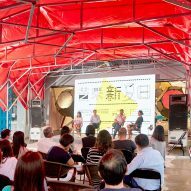 The inaugural event hosted at the cultural centre is a retrospective exhibition of work by People's Architecture Office, including a temporary pavilion it erected in Shanxi province from stacked yellow and red shipping containers. 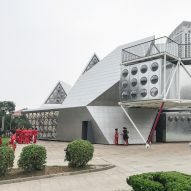 Photography is by Zhu Rui and People's Architecture Office.